Documentary about biofuels: "The Brazilian Revolution"
Tonight, Europe's leading cultural television channel and production house, ARTE, airs a documentary on biofuels in Brazil (presentation of the film in French and in German). The work titled "Biocarburants: la révolution brésilienne"/"Sprit aus Zucker! ", made by Pierre-Olivier François en Christian Popp, asks whether the Brazilian example is to be followed by other countries. The industrial-scale, technology and science-driven ethanol sector in Brazil is over 30 years old. Currently, more than 70% of all cars in the country use the fuel which is made primarily from sugarcane. The biofuel is both cheaper and considerably less polluting than gasoline. Moreover, contrary to its fossil counterpart, it is renewable and the expansion of its production can be planned. The documentary follows José, a small sugarcane farmer in São Paulo state who has been growing the crop all his life to make sugar from it. Thirty years ago, he started supplying one of Brazil's first ethanol plants. In Brazil, the production of ethanol benefits from optimal conditions: an abundance of land, sun and water, but also of a scientific effort supported by the government. In private and state-run laboratories and institutions, researchers are developing new crop varieties, new processing and logistical technologies with which to increase the productivity and efficiency of the sector. Car manufacturers in Brazil soon followed and today all of them have so-called 'flex-fuel' models on the market. Brazil's state-owned oil giant, Petrobras, is a major player in the sector and supporter of the industry. But even in the case of a green, renewable, and sustainably produced energy source, the picture is not all that rosy. Until recently, the main beneficiaries of the industry have been the large agro-industrial firms who enjoy scale-advantages and rely on highly mechanised production. However, the situation is changing gradually in favor of smallholders. Brazil's landless people, united in Latin America's largest social movement, the 'Movimento dos Trabalhadores Rurais Sem Terra', are beginning to enjoy the benefits of the industry's expansion, because they have found a listening ear in Brazil's recently re-elected president Luis Inácio Lula da Silva. The Lula government has created a set of policies that is explicitly aimed at pulling small farmers into the sector: large companies who source their feedstocks from smallholders, receive tax breaks. Several multinationals have already accepted the deal. Extension services have been created aimed at training and informing the smallholders about the biofuels program and its lucrative economic opportunities. And with a promising project in the northern province of Natal, Petrobras is setting the example by buying raw materials for the production of biodiesel from family-run farms only. The documentary can be watched on ARTE, tonight at 10.20pm CET, and will be shown again on Friday, March 2 at 3.10pm. An online version is to follow later [entry ends here]. The African oil palm is a crop that yields an enormous amount of biomass (earlier post) that can be used for the production a wide range of plant-based products. 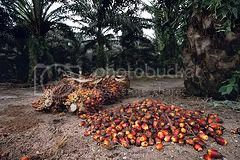 Currently, only the oils extracted from the fresh palm fruits are considered to be a commodity, but this situation is changing very rapidly. Waste-streams from plantations and from processing operations have become valuable biomass fuels in themselves, that are increasingly being used for power generation at the processing plants, instead of fossil fuels (earlier post). Liquid waste-streams from the oil extraction process are being used efficiently for the production of biogas (earlier post). Finally, ligno-cellulosic plantation and processing residues can be utilized either as a feedstock for next-generation ethanol (earlier post), or for the production of plant-based materials such as bioplastics [on bioplastics from oil palm residues, see this document *.pdf]. The most obvious of markets for palm oil is of course that of biodiesel. But to make palm based biodiesel useable in the cold climates of the Northern hemisphere, it has to be chemically transformed so that its cloud point is brought down. The Malaysian Palm Oil Board recently developed a patented process that achieves this transformation in a relatively efficient manner, while an Ecuadorian company did so too (earlier post). However, the process aimed at increasing the cold tolerance of the fuel, is based on physically removing a fraction of the biodiesel, resulting in a by-product that may make up 15% of the primary feedstock. This reduces the overall energy balance of the fuel and negatively affects its economics. These enhanced oils and lubricants give the consumer the advantages of longer machine life from reduced ware and superior performance at high temperatures and pressures associated with "moly" lubricants. The oils and lubricants are highly biodegradable and have the promise of non-hazardous waste disposal. These new oils and lubricants also offer the promise of reduced crank case and other lubricant emissions to improve air quality. The oils and lubricants are a solid marketing complement to ethanol-fueled automobiles. It only makes sense to use "Green", "Clean technology" oils and lubricants once the car owner has made the commitment to a renewable, environmentally friendly energy solution. There are a number of testing, process, specification, approval, supply channel and distribution channel issues that need to be overcome before these oils and lubricants can be offered for sale. In a development of major importance for the future of the biobased economy, plant biologists at the University of Connecticut have created a tool that may help alleviate public concerns surrounding genetically-modified plants. Controlling the flow of transgenic genes into the wild via pollen and seeds has been a huge concern to the public and a major challenge for scientists specializing in agricultural biotechnology. The tool, called a “GM-gene-deletor,” could prevent genetically-modified gene flow into non-biotech crops or weeds. The invention may be particularly useful to confine genetically altered genes used in vegetatively propagated, undomesticated bioenergy crops, such as switchgrass, sugarcane, tropical grass species and energy trees such as poplar, willow, acacia or eucalyptus. Most importantly, it overcomes the problems with so-called 'terminator seeds', which have made poor farmers in the developing world dependent on multinationals, from which they have to buy new seeds every season. Traditionally, farmers use the seeds from their harvested crops to grow new plants the next season. But 'terminator technology' used in GM-crops kills the fertility of these seeds, forcing the farmer to buy new ones over and over again, thus creating a total dependency. The GM-gene-deleter may now make it possible for farmers in the developing world to become full owners of high-yield, pest-, disease- and drought-tolerant energy crops, which do not spread their altered genes into the environment and the seeds of which can be used to grow new crops. This independence from large multinationals may overcome the devastating effects of the current situation, as it was recently outlined in an interesting anthropological study of farmers in Warangal, India (earlier post). The technology, developed in the laboratory of Yi Li, associate professor of plant science, provides a successful method for eliminating all the transgenic genes from pollen and seeds if needed. The research is published in the March issue of Plant Biotechnology Journal [abstract]. The GM-gene-deletor also could be used in crops that are genetically modified for the production of pharmaceuticals to block the accidental transmission of these traits into food crops through seed or pollen. The new technology also holds the potential to end a long-standing debate on so-called “terminator” gene or “terminator” seed technology that has pitted major agricultural biotechnology companies against poor farmers in developing countries. The terminator technology inserts terminator or suicidal genes into genetically-modified seeds to ensure that no genes from genetically-modified crops contaminate non-genetically-modified crops. This process protects the companies’ patents and could alleviate some of the same consumer concerns Li’s technology addresses, but at the expense of poor farmers in developing countries, who would have to buy fresh seeds every year because the terminator gene system renders the genetically modified plants sterile. The terminator technology has yet to be commercialized because of the problems it poses for farmers in developing countries. Li’s group at UConn started this project in 2000 with funding from Connecticut Innovation Inc., the Consortium for Plant Biotechnology Research / U.S. Department of Energy, and UConn. The team, and collaborators in China and at the University of Tennessee, reported a novel use of two site-specific DNA recombination systems to assemble a highly efficient gene eliminator that specifically targets the foreign genes. By incorporating these systems into the genome of the genetically-modified plants, the scientists found the undesirable genes were removed from the pollen and seeds of the plant with as much as 100 percent efficiency. Because of the exceptionally high deletion efficiency observed in the experimental plants, Li and his collaborators anticipate enormous potential for the technology to be used in large-scale plantings of agricultural crops, as well as genetically improved trees and bio-energy/bio-fuel and pulp-generating plant species. China (earlier post), the United States (earlier post) and the European Union (earlier post) have all recently said they aim to increase their use of renewable energies like wind, solar and biofuels, to address global warming and energy security concerns. Much depends on the economics of such clean energy technologies, some of which are still much more expensive than conventional fossil fuels like coal and oil. The following table is a comparison of 2005 and projected medium-term (2010-2020) costs per energy source, in U.S. cents per kilowatt hour, created by Imperial College London, as quoted by Reuters. Some notes have to be added to this projection. First of all, the data are from a time when fossil fuel prices were only beginning their steep climb (at the beginning of 2005, a barrel of oil stood at US$45 and reached records in July and August of 2006, with prices at over US$75). With 'Peak Oil & Gas' being taken more and more seriously, prices may well rise far more quickly and steeply than Imperial College predicts, making alternatives much more competitive. Likewise, uranium oxide prices have skyrocketed over the past two years, now reaching 'precious metal' levels, at US$85/pound for U308. The medium term outlook is one of continuously increasing prices. Thirdly, the study does not look at biogas production. Again, recent research points out that Europe can replace all natural gas imports from Russia, by 2020, with biomethane that is considerably cheaper if scaled-up and made from dedicated energy crops (earlier post). On another note, even though the table refers to Carbon Capture and Storage (CCS) technologies that can be applied to coal and gas power stations, it does not count in CCS used with the cheaper alternative, namely biomass. Using carbon dioxide storage technologies with biomass results in a system called 'Bio-Energy with Carbon Storage' - the only carbon negative energy system that can take us back to pre-industrial CO2 levels in a relatively short time (earlier post). Obviously, if biomass is cheaper than coal and gas, then CCS with biomass is cheaper than CCS with coal and gas. The BECS concept can of course also be based on gaseous biofuels, such as locally produced biomethane. All in all, it looks like both wind power and biomass stand to become the most viable renewable energy sources for the future. Contrary to both wind, solar and tidal/wave power, biomass has the advantage that it can be traded globally and physically. It can be grown where it makes most sense to to so, and shipped to markets in an efficient manner, that is without losing too much energy in the process and without contributing too much greenhouse gas emissions (earlier post). Two leading car manufacturers will be present at the International Agricultural Show in Paris (March 3-11, 2007), one of the largest fairs in its kind. French car maker Renault and Swedish manufacturer Saab will showcase their biofuel capable vehicles at fair's section on 'Cultures et filières végétales' [*.pdf French], where biofuels are highlighted. Saab will present its 9-5 'Biopower', a car that has enjoyed a runaway success in Europe, responsible for the manufacturer's record sales in 2006 (earlier post). Saab has meanwhile developed a version of the Biopower capable of running on pure ethanol. Renault's participation will highlight its active involvement in the development of biofuel-related technologies with the display of an E85 bioethanol Mégane (pictured) alongside one of its B30 biodiesel-compatible engines, the 1.5 dCi 85hp. Renault considers biofuels to be the most realistic, effective and economical solution for curbing CO2 emissions in the medium term. Produced from vegetable matter, they represent a diversified renewable energy source capable of diminishing our dependence on fossil fuels. This spring, Renault is poised to launch a Mégane powered by an E85 bioethanol fuelled 1.6 16V 110hp engine, the brand's first bioethanol vehicle in Europe. Derived from existing powerplants in the range, such bioethanol engines require specific development to permit them to run on different types of fuel (petrol or E85 ethanol). The principal differences concern the fuel system as a whole and the injection system (injectors, sparkplugs, ECU), as well as the pistons, valves and valve seats. Based on experience acquired since 2004 in Brazil, where it sells models functioning on E100 bioethanol, Renault anticipates that "50 per cent of its petrol-engined vehicles on sale in Europe will be able to run on a blend of petrol and up to 85 per cent of ethanol by 2009." Since late 2006, Renault has sold B30 biodiesel-compatible versions of Trafic 2.0 dCi and Master 2.5 dCi. Aimed principally at companies operating large fleets and equipped with a specific pump, these vehicles cost the same as the equivalent conventional diesel-powered versions. They are also the first concrete examples of the pledge incorporated in Renault Commitment 2009 that "all the diesel engines in the range will be capable of running with 30 per cent biodiesel by 2009." The diesel 1.5 dCi 85hp engine displayed on the stand illustrates how these developments can be carried over to the world of passenger cars. An educational approach to the importance of global warming-related issues Informing the public and enhancing its awareness of the stakes associated with global warming are seen as primordial to Renault's eyes. This necessity is addressed by a bid to explain and communicate the advantages of automotive biofuels in the fight against CO2 emissions. Visitors to Renault's stand will be informed about the advantages of biofuels and how the industry functions. The benchmark biofuel for petrol-powered cars is bioethanol which is produced from a variety of sources – ranging from corn (USA) and sugar cane (Brazil) to beetroot and wheat (Europe) – depending on the region of the world. Diesel vehicles are fuelled by biodiesel which is produced from oleaginous plants (rapeseed, sunflower, soya, jatropha, palm oil, etc.). Visitors will also be told of the value of biofuels through the so-called 'well-to-wheel' analysis which assesses the CO2 performance of different fuel types across their entire life cycle. In the case of B30 biodiesel, CO2 emissions are 20 per cent lower compared with a conventional diesel fuel and can be as much as 70 per cent lower in the case of E85 bioethanol (derived from sugar cane) compared with petrol. These differences are the result of the process of photosynthesis. While growing, plants absorb a quantity of the CO2 present in the atmosphere, a factor which partially compensates for emissions released during the fuel's production and combustion. This phenomenon does not apply in the case of conventional fuels. Moreover, just as it did during the 2006 Paris Motor Show, Renault will be giving away 20,000 free copies of its flash card-style 'Incollables' game. This educational tool was developed in association with France's Agence de l’environnement et de maîtrise de l’énergie (ADEME, or Agency for the Environment and Energy Management) and has been designed to inform and enhance awareness of environmental protection issues in the form of a quiz.